The shortest distance between two points is a straight line. You’ve heard that before, right? It’s true of many things, including – in the figurative as well as the literal sense – disc golf putting. If you’d like to transform yourself from an inconsistent putter who is frustrated by frequently missing putts your peers seem to make all the time (Point A), to someone known for their solid, consistent putting game (Point B), this ‘Straight Line’ tip might get you there quicker than any other adjustment you can make. More than any other part of the game, putting is all about precision and accuracy. If you miss your release point by even a few degrees it could very well result in a missed putt- even on very short attempts. The best way to prevent this from happening is to keep both the disc and your hand on a rigidly straight line from the time you start the take-back until after the disc leaves your hand (the follow-through). The bottom line: Eliminate the left-to-right movement in your putting form, and you’ll greatly reduce your left/right misses. Just like that! Figure 1 is obviously a diagram using crude symbols, but it’s a good thing to visualize if you choose to practice this key ingredient to consistently accurate putting. Another option is to imagine a narrow tunnel barely the width of your disc running between you and the basket. Your objective as you take the disc back then launch it forward should be to keep the disc and your hand from hitting the sides of the tunnel, holding onto it until your arm is stretched as far as it can toward the target. The reason this tip works so well is simple. A disc pulled back and then propelled along a straight line will begin its flight heading in the exact direction at which that line points. Assuming your aim is true, all you need to do is open your hand when your arm is stretched as far toward the target as it will go, then keep reaching with all five fingers for a half-second more. Whether you prefer the ‘Push,’ ‘Spin,’ or ‘Pitch’ putting technique; whether you use an ‘In-Line’ or a ‘Straddle’ stance, the straight line principle works and is embraced by nearly all top pros. Want proof? Do a little research on YouTube and you can easily spot the effort to keep the putting hand on the line toward the basket even after the disc leaves the hand. Paul Mcbeth and James Conrad provide obvious examples. Watch Ricky Wysocki and you’ll see that the straight line is even more essential to successful pitch putting. Contrast that with a short ‘toss’ or ‘flip’ where your hand and the disc travel in an arc. Because the movement isn’t directed in a straight line headed toward the target, accuracy depends on releasing the disc at just the right moment. Too early and you miss ‘short-side.’ Too late and you pull it wide. As diagrammed in Figure 2, a variance in your release point of less than an inch can result in completely missing the target. To further drive home the importance of keeping putts on ‘the line,’ let’s explore the fact that putting in disc golf has very little in common with throwing. Contrary to what most beginners and a surprising number of more seasoned players seem to think, putting isn’t simply a backhand throw modified into a short, soft toss. The differences begin with the stance. For a right-handed backhand throw, a player’s feet are typically positioned with her toes pointing roughly 90 degrees to the left of the target. All standard putting methods, on the other hand, call for the player’s toes to be pointed, and shoulders squared, directly at the target. This is for a reason; It allows the player to pull the disc back and bring it forward on the same line as her line of sight- something that aids greatly in aiming. To help understand this, think of how we aim in archery or with firearms- with an eye peering directly down the line of flight. Unlike rifles and longbows, however, in disc golf it’s up to us to provide both the aim and the momentum that ensures the projectile heads directly at the target. It’s not as simple as pulling a trigger or releasing an arrow. The line of sight advantage only matters when the disc is kept on that same straight line until it leaves your hand. Keeping your disc on a true straight line provides greatly improved accuracy and consistency, but the tradeoff is a restriction on power generation. It gets easier and more natural with practice and repetition, but holding the line can be hard at first. This is why even players who normally demonstrate proper straight-line form sometimes pull their putts wide when attempting shots at the edge of (and especially beyond) their range. I’ve made my best argument for why eliminating the left/right movement from your putting form is the secret to improved accuracy and consistency. Hopefully it seems logical enough that you want to start working on it right away. As I mentioned earlier, it most likely won’t be an instant transformation. You may struggle to generate spin, power, or both. In Part 2 of this post I’ll provide specific details that should help, complete with a practice technique and a couple video demonstrations. To make sure you know when it’s out, follow this blog on WordPress and our School of Disc Golf and Play DiscGolf Facebook pages. When we watch a full-power drive performed by someone who can really huck it, the ‘run-up’ is a big part of the show. Whether it’s a literal running start or a couple smooth strides, and whether the technique used is an X-step/scissors step or crow-hop, that bodily forward motion appears to contribute greatly to distance the disc travels. But does it, really? The short answer is no. The large majority of the power that translates to long disc golf drives comes from arm speed, maximized by hip/torso/shoulder rotation. The ‘run-up’ adds only marginally to that equation, resulting in between 5-15 percent more distance. And that’s only IF (and it’s a big ‘if’) everything is coordinated and timed perfectly. The physical side of disc golf is as much about control as it is power. More, actually, because the harder you throw in the wrong direction, the farther the disc can go in the wrong direction. And if you play on tight, wooded courses it doesn’t matter how hard you throw; Miss that gap and your disc ain’t goin’ nowhere! Well, nowhere good, at least. Golf in all its forms is first and foremost a game of accuracy, precision, and consistency. Standstill drives with perfect form and timing beat ill-timed run-up drives every time. Note how this player’s disc and weight transfer from back to front foot (which is mostly lifted off the teepad) appear perfectly in synch. Photo by Jack Trageser. When I’m giving private lessons (with the exception of pros and top amateurs who already demonstrate a solid grasp of proper driving technique) I insist on starting with a stand-still throw. No run-up. No steps at all except for a back foot toe-drag on the follow-through. For details check out this post I wrote several years ago titled “Building Blocks of Basic Backhand Technique.” It is still one of the most viewed pages on our website. I decided to write this particular post after reading a testimonial from a recent client. You can read his full comments here if you like, but the most relevant snippet is shown below. Perfect your timing and weight transfer. Keep your weight back until a fraction of a second BEFORE you launch the disc. NOTE: This is the part that most often goes awry when a player tries to incorporate a run-up too soon. Finally, when you’ve mastered the first three, slowly integrate a run-up by starting slowly. The important thing is to keep your timing and release point intact. I recommend throwing backhand drives exclusively with the standstill technique for at least a month so that once you add a run-up you’ll know instantly when the timing is right and when it isn’t. You’ll likely suffer a loss of accuracy and control at first, so it’s best to experiment during fieldwork and rounds that don’t matter. Remember that a run-up itself only increases your driving distance marginally. It’s the other three elements listed above that really help players make big strides in not only distance but accuracy and consistency as well. Good luck, and happy chuckin’! We go out of our way to share news stories that cover disc golf growth at the local, grassroots level for two good reasons. Grassroots growth is the secret sauce for a sport that is spreading like a virus despite almost no corporate funding, and, amazingly, no other disc golf media talk much about it. On January 2nd tusconlocalmedia.com published a comprehensive piece listing what their reporters believe will be the biggest stories in that region in 2019. Near the top is a theme that is all too common these days, a public (taxpayer funded) golf course that is losing more than $1 million a year. Who wants to bet they’ll be adding disc golf sometime soon? The same story mentions a new course coming to the El Rio Preserve in Pima County. If you live in Oro Valley, help them connect the dots! A weee bit to the south, in Crossville, TN, a story that focuses on whether the town council should market itself as more than “The Golf Capital of Tennessee,” the real news (as far as we’re concerned) is buried near the bottom. The council is raising funds to build a #newdiscgolfcourse and should be ready to begin soon. If you live in Crossville, get in touch with them and let them know you’re excited- and maybe offer to help! In LaJunta, CO, a story detailing the city’s extensive Trails project, kudos are given for the installation of another new course. According to the story by Bette McFarren, “Also helping with the continued development of Anderson Arroyo, said (Parks and Recreation Director Brad) Swartz, is the popular Disc Golf Course installed in 2018.” Judging by the picture accompanying the story, the course replaced a previously neglected open space and now provides exercise and recreation for numerous residents. Have any of our readers played this one yet? Finally, here is a story from Bowling Green Daily News about local business leaders in Logan County, KY wanting the county to purchase a golf course that is for sale and turn half of it into a park (leaving 9 holes of the golf course intact). Their plan calls for the park to include a disc golf course, so here’s an extension of that idea. Build the park and disc golf course, and on the remaining 9-hole golf course, add disc golf to that as well. The county would suddenly be able to offer a 36-hole disc golf complex- a sure tourism draw these days when done right. If you know someone who lives in Bowling Green or Logan County tell them to pitch the idea right away. The people to talk to are listed in the story. If you’re like me, the desire to ‘sell’ the sport of disc golf to anyone who crosses your path comes as naturally as breathing, blinking, and throwing a hyzer. As decent human beings we want others to enjoy the benefits of the sport we love, right? So the sales pitches just gush forth. But are they as compelling and effective as they can possibly be? While displaying a sincere belief in and passion for something is a powerful element of effective sales, the message itself is also important. And so is tailoring the message to the audience. But often we don’t have time for anything but a quick summary of the game and it’s best features. Normally this means quickly explaining that disc golf is fun, anyone can play, and anyone can afford it. If I have a chance for a more in-depth discussion, I’ll drill down to more details on one or more of disc golf’s high points based on what I know about those listening to me. When money is obviously an issue I will stress the affordability, pointing out that most courses are free to play and one needs only a few inexpensive discs. Most who know little about the sport are usually surprised that courses are usually free because they are aware that ball golf courses all charge significant fees. Disc golf is for everyone. When speaking to someone whose concern for the environment shapes many of the choices they make, I am quick to contrast disc golf with ball golf in that context. Since the state of the playing surface matters little, a disc golf course can exist almost anywhere without any manipulation of the natural setting. Although some courses are installed in groomed park areas, watering, mowing, and landscaping are not necessary. If someone wants to play a sport and experience nature at the same time, you can’t do better than disc golf. Disc golf is steadily growing, mostly due to word of mouth and sales pitches similar to the ones described above. Because of the game’s supreme accessibility, a large percentage of those who try it become enthusiasts themselves in short order. It is my opinion, however, that should these facts about disc golf become more widely available, the drip-drip-drip of disc golf growth will become a deluge. From dripping point to tipping point. I’ve felt this way for some time, and it led me to write a book called The Disc Golf Revolution. After a successful Kickstarter campaign, the book should be available by Fall 2017. You can learn more at http://playdiscgolf.org. A breakthrough Disc Golf Book! This is School of Disc Golf Headmaster Jack Tupp here, with an important message for all disc golf enthusiasts. I’ve written my 2nd disc golf book, titled “The Disc Golf Revolution,” and I wrote it for you. Not to read so much (although I hope you do read it and am certain you’ll enjoy it), but to give and recommend to everyone who you wish knew the full story of disc golf. In other words, everyone! I’ve launched a Kickstarter campaign to promote the book, and I’d greatly appreciate your support by backing the project and sharing it everyone you know. You can do both by visiting playdiscgolf.org right now. Start Playing Today!- Designed to enable readers who by this point in the book are excited to give it a try to hit the ground running, this chapter answers the following questions: How do I find the closest courses? What do I need to get? What are the rules? How do I learn to play? One final note: If you have found this blog useful in improving your disc golf game, one of the Kickstarter rewards is a copy of my other book, Three Paths to Better Disc Golf. Check it out! How do you perform on pressure putts? Are they a weakness in your otherwise solid disc golf game? If the first question caused you to grind your teeth and/or break out into a cold sweat, and if you grudgingly answered ‘yes’ to the second question, this post is for you. The obvious reason for this timely advice is to help an already frightened and nervous person from becoming paralyzed with fear. Looking down in such situations reminds us of the dire consequences if things don’t go right, and healthy fear is one of the traits hard-wired into all species. But alas, not all fear is healthy, nor helpful. Take away the consequences -possibility of serious injury or death, with immense pain along the way, in this case – and that walk across the rickety bridge is really no big deal. It’s just walking, after all. But when one false step could turn into a real-life Wile E. Coyote plunge, it suddenly gets much harder. And this is true of pretty much everything. The more it means to you, the greater the likelihood that anxiety comes into play. And anxiety, needless to say, never enhances performance. Good news, the solution is simple! However, it’s not easy, at least not in an instantaneous, problem-solved kind of way. You gotta consciously work at overcoming a tendency that, like garden weeds, can never be entirely eliminated. But if you make a sincere effort to make this change you should see some results almost immediately. Here is the essence of the one and only true way to combat performance anxiety. Drumroll, please . . . . . . Think about what you’re trying to do, not what you’re trying to accomplish- and definitely not why you’re trying to accomplish it. Many believe that athletes who are known as ‘clutch performers’ must somehow thrive on the pressure that negatively affects everyone else. That’s not true. They have simply trained themselves to concentrate on the raw components of the task at hand and block out everything else. The general idea of focusing on actions rather than results is nothing new. Instructors, trainers, and coaches have applied it to everything imaginable- far beyond the realm of athletics. I’ve written about the applications of this concept multiple times before and have included some links later in this post. There are many techniques that will help you accomplish this game-changing transformation. Adapt one of mine, or come up with your own. The purpose here is to help you understand and embrace the basic concept. The rickety bridge/”Don’t look down!” analogy just recently occurred to me, and I think it can be instrumental in helping golfers who already realize that the primary obstacles between them and lower scores are often mental, but haven’t gotten beyond that vague realization. Want yet another example? I bet whoever trains people to diffuse bombs stresses the fact that the mind must remain focused 100 percent on the task at hand. Thoughts of beloved family members and fear of being blown to smithereens could result in shaky hands or a momentary confusion between red and blue wires. Next thing you know, BOOM! As we all know, some missed putts result in different kinds of explosions (or, in some cases, implosions): Exploding scores, tempers, and visions of that personal-best round that was so close you could taste it. And it’s not the miss itself that is so frustrating, but the awareness that it was due to a brain twisted into knots. If you now believe the simple solution revealed above (think about what you’re trying to do, not what you’re trying to accomplish) has merit, and are wondering “How, exactly?” that’s an excellent question. There is no one-size-fits-all answer, but I think I can get you headed in the right direction by sharing a little about my personal strategies, tactics, and tricks. Notice I did not list “make the putt” as something I’m trying to do. Do NOT think about what you’re trying to accomplish, or why you’re trying to accomplish it. The second you start thinking about making the putt, two bad things happen. You stop thinking the productive “Do This” thoughts that give you the best chance of success. You can’t simultaneously follow two trains of thought. You open the door to why you want or need to make the putt. The bigger the situation, the farther the drop from that rickety bridge. It doesn’t matter whether a really bad thing will happen if you miss (you lose the round, for instance) or a really good thing won’t happen (you don’t birdie hole 13 for the first time ever). The effect is the same. Back in 2011, I came up with a pre-shot routine wherein I practice my putting motion several times, full speed but without the disc in my hand, right before my actual putt. I discovered several benefits in doing this, and you can read the post or watch this short video if you’re interested in the full explanation. I list it here because one of those benefits of the routine is that it allows me to think about my process keys while practicing my “stroke,” and then when it’s time to execute the actual putt, my last final thought is always the same: Do exactly what I just did on the last practice stroke. Just that one thought, and nothing else. For me, there is no other correct final thought before I pull the trigger. The routine is now habit for me, which makes it easier to remember even in the most high-pressure moments. I’m also more likely to identify renegade “value” thoughts that try to invade my routine in time to replace them with “process” thoughts. Extending the routine further backward is another way to be sure I’m thinking about the right things at the right time. A successful shot starts well before I step up to my lie. In this post I discuss the proper sequence of first assessing the situation, then choosing exactly what to do, then executing. If I complete the first two steps before I step up to my lie (this post was for all shots, not just putting), I have a better chance at being able to focus on process, and only process, when it’s time to execute. However you get there, separating process from value on every throw will result in lower scores and less stress. Find something that works for you, and stick with it. It’ll be worth it! Every week, thousands of people experience disc golf for the first time. (I have no reference for this, but it sounds about right, doesn’t it?) Whatever the actual figure, it’s growing quickly because a good number of those people fall in love with the sport. They continue to play, share their passion with others, and acquire a sudden desire to learn all they can about this wonderful thing that until recently didn’t exist for them. Until recently, those seeking to quench this thirst in the literary world were let down in a big way, or worse, terribly misinformed. The handful of disc golf titles on the market claiming to provide ‘all you need to know’ about disc golf fell far short of the promise and likely reinforced the opinions of some that disc golf is not yet to be taken seriously. 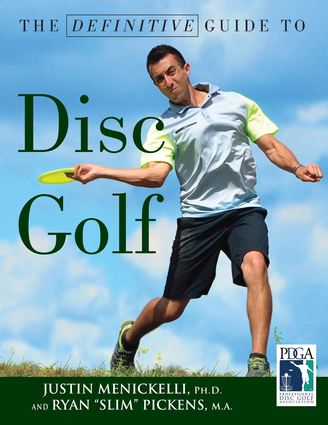 The photo on the cover of The Definitive Guide to Disc Golf shows Paul McBeth demonstrating textbook sidearm form, which is explained in the third section of this textbook-like book. The Definitive Guide to Disc Golf is indeed what it claims to be. The information it offers up is accurate, relevant to new players, and presented in the articulate language of a college textbook. The fact that the authors’ advanced degrees are listed along with their names (Justin Menickelli, Ph.D. and Ryan ‘Slim’ Pickens, M.A.) on the cover provide a good indication that this is the exact impression they wish to convey. In fact, I can see their book being used as the primary text for the growing number of disc golf courses on college campuses. The PDGA logo is also prominently displayed on the cover, but I could not divine the exact reason why. The book is divided into three main parts, the first of which is titled ‘The Nature of the Game.’ It includes a section on choosing the best equipment, shoes, and clothing. Makes sense. But the rest of the chapter is mostly devoted to tournament play and PDGA membership, which I at first found odd considering a very large majority of all regular disc golfers never delve into formal competition. Then I realized that those who enjoy disc golf but consider it a fun, affordable thing to do once a week, and leave it at that, likely won’t be the ones reading this book. If you, like me, love disc golf enough to acquire The Definitive Guide, there is a good chance you will want to at least dabble in tournament play as well. Other subjects covered in the Part I include the history of the game, course design, and an excellent treatment of rules and basic etiquette. Information that is useful for the here and now is blended well with interesting facts that will add depth to a new disc golfer’s appreciation for the game. Part II is called The Science of the Game, and it ranges from 10 lessons on mental training to disc golf-specific exercises to a college level examination of the physics of disc golf flight. I mentioned that disc golf classes would use this book as a text, but it’s not a stretch to think that a creative physics professor might use it as well. Menickelli’s Ph.D. in Kinesiology is on display in this detailed discussion of vectors, form drag, surface drag, and dynamic fluid force. Those who can follow the explanation will end up with an excellent understanding and appreciation of the many factors affecting disc flight. With diagrams such as these, this book will serve equally well as a text for college courses and physics. Part III is devoted to providing instructions on every type of grip, throw, putt, and shot known in the disc golf universe. As the owner of School of Disc Golf, I teach beginners and also coach tournament players, and I didn’t come across anything with which I disagreed or thought inaccurate. Superb photos and illustrations are used liberally, and there is so much information crammed into the short treatment allotted to each technique they act like the water competitive eaters gulp down with each bite, enabling the reader to digest beefy concepts. In the preface, the authors state a goal of writing a book that would be ‘read cover to cover, and to provide readers with a helpful resource that warrants keeping a copy close by to reference.’ The wide range of material covered guarantees they’ll accomplish the second part of that goal, if not the first. I can confidently say that anyone who plays disc golf on a regular basis, or plans to, would do well to get themselves a copy of The Definitive Guide to Disc Golf. It’ll end up looking as used as the rule book in the side pocket of your bag. If only it would fit!